The next video won’t be posted until Wednesday this week, as I’m taking a couple days off for a little medical procedure that men my age are recommended to get. Hair transplant? No, it’s much further down. That’s right, I’m going in for a colonoscopy, and as a minor YouTube celebrity, I feel it’s my duty to encourage all my fans and viewers over the age of 50 to do the same. I just skimmed the brochure, but apparently this simple test can save your life. Remember, the longer you’re around, the more traffic these videos get. So, if you’re my age and haven’t had one done yet, please contact your doctor and get it scheduled as soon as possible…and as always, enjoy! It's really not that bad, and it's better to do it than not. And the sedative is kinda fun, as is the recovery, after which people sympathize and deny you nothing. I can't wait until my next one! I don't know about it being "fun" or being hardly waiting for the next one... but it is the smart thing to do! Had mine last year Chef John. You are so much fun to watch/listen to without medication (I assume). Would love to see you loopy post meds. (Hey, it could take you to the majors on Youtube. Ha!) Thanks for the joy you give and best wishes on your procedure. My own father now has terminal colon cancer and he did NOT get checked regularly. So please make sure to have this procedure done...it could truly save your life. Good luck with the test Chef John, all the best! Good luck with the procedure, it's fairly simple apart from the preparation which is a pain in the Bum. You'll be looking forward to a generous serving of something delicious afterwards, the Coffee and Biscuit they give you, doesn't help much. Anyway. Good luck. You're being very sensible and thanks for encouraging other older Men to accept this procedure. I couldn't not hear "Enjoy!" in your voice. 1. Skip anesthesia it is absolutely not worth the risks it entails. Colonoscophy without anesthesia is not a big deal, basically dealing with bad gas for 40 min or so. 2. Spend the few extra bucks on the Prepopik prep stuff, it's not bad at all and you get to just drink whatever clear liquids you like such as iced tea and white grape juice. 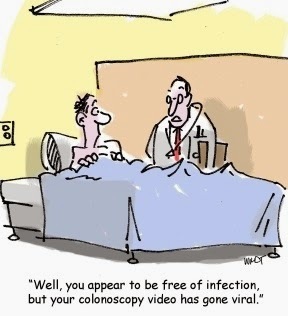 Without anesthesia it's much more intersting since you can watch the monitor as the colonoscophy proceeds. You also get a better appreciation of the team as they work to pull a 22mm polyp out of your backside. Hope everything comes out OK in the "end". No worries as this is a painless procedure. You won't even feel violated after it is completed. Like the one writer stated, the recovery time is a little fun. Only buzz that I am able to get nowadays. Im 43, with a family history of FAP (Familial Adenomatous Polyposis) - genetic testing POST colonoscopy indicates I do not carry the gene, nor will my children, but I took one for the team - literally! Awww, PJ beat me to it. Good luck! Overrated as to prep and procedure. With suitable anesthesia you will neither hear nor see anything andbe ready for a nice dinner that evening. Hey mention my name - they'll give you a good seat! So, did you find a way to come up with a recipe for that nasty human-drain-o stuff you have to drink before Gastro-Internalist gets up-close 'n' personal? Thanks for all the kind words and encouragement! Everything went well. Oddly, I am in the mood for menudo. Do you have a good recipe for that? Now that it is over, you might enjoy this YouTube video.